Gigabit Ethernet uses the same 802.3 frame format as 10Mbps and 100Mbps Ethernet systems. This runs at ten times the clock speed of Fast Ethernet, backward compatibility is assured with earlier versions, increasing its attractiveness by offering a high bandwidth connectivity system to the Ethernet family of devices. Gigabit Ethernet is defined by the IEEE 802.3z standard. This defines the gigabit Ethernet media access control (MAC) layer functionality as well as three different physical layers: 1000Base-LX and 1000Base-SX using fibre and 1000Base-CX using copper. These physical layers were originally developed by IBM for the ANSI Fibre Channel systems and used 8B/10B encoding to reduce the bandwidth required to send high-speed signals. The IEEE merged the fibre channel to the Ethernet MAC using a gigabit media independent interface (GMII), which defines an electrical interface, enabling existing fibre channel PHY chips to be used and enabling future physical layers to be easily added. 1000Base-SX, also known as 1000Base-SX, is a physical layer specification for Gigabit Ethernet over fibre optic cabling as defined in IEEE 802.3z. SX stands for short wavelength. And 1000Base-SX uses short wavelength laser (850nm) over multimode fibre as opposed to 1000Base-LX, which uses long wavelength laser over both multimode and single-mode fibre. The maximum distance of (multimode) fibre, based on 1000Base SX is 550m. This gigabit Ethernet version was developed for the short backbone connections of the horizontal network wiring. The SX systems operate full-duplex with multimode fibre only, using the cheaper 850nm wavelength laser diodes. The maximum distance supported varies between 200 and 550 meters depending on the bandwidth and attenuation of the fibre optic cable used. The standard 1000Base-SX NICs available today are full-duplex and incorporate LC fibre connectors. SFP module is a hot-swappable input/output device that plugs into a Gigabit Ethernet port/slot, linking the port with the fibre-optic network. SFPs can be used and interchanged on a wide variety of Cisco products and can be intermixed in combinations of IEEE 802.3z compliant 1000BaseSX interfaces on a port-by-port basis. 1000BASE-SX SFP supports link length of up to 550m (depending on fibre type) on multimode fibre at 1Gbps. This optic works at 850nm wavelength and uses a LC connector. 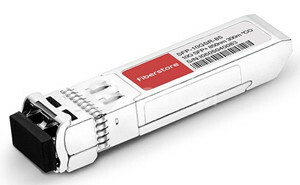 If you want to purchase cheaper compatible 1000Base-SX SFP modules online, Fiberstore may be the better choice. 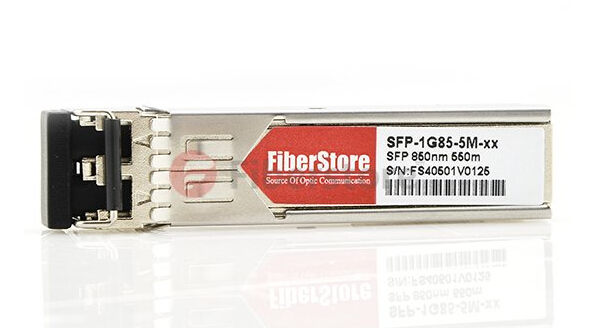 Fiberstore is the largest fibre optics manufacturer of China, which offers various of SFP modules. And you will find third-party optical modules provided by fiberstore, like HP J4858b, J4858C, Jd118b and Netgear agm731f also Cisco GLC-SX-MM, etc. Compatible SFP transceiver modules offered by Fiberstore are third-party and fully compatible with major brands (Cisco, HP, NETGEAR, Juniper, etc.) and supported by a Lifetime Warranty. Besides the compatible SFP, we can also customize SFP transceiver modules to fit customers’ specific requirements. Contact us by live chat or mails if you could not find the exact items you need. This entry was posted in Fiber Optic Transceivers and tagged 1000Base-SX SFP Transceiver, Netgear agm731f on November 18, 2014 by Admin. The SFP is the more compact optical transceiver used in optical communications. It interfaces a network equipment mother board to a fibre optic or unshielded twisted pair networking cable. This is probably the most diffused transceiver format available with a variety of different transmitter and receiver types, allowing users to select the appropriate transceiver for each link to provide the required optical reach over the available optical fibre (e.g., multimode fibre or single-mode fibre). A drawing of a SFP transceiver is presented in Figure 1, where the particular connector for the input and output fibres that, with different dimensions, is present in all the transceivers is evidenced. Optical SFP modules are commonly available in four different categories:850nm (SX), 1310nm (LX), 1550nm (ZX), and WDM, both DWDM and CWDM. SFP transceivers are also available with a copper cable interface, allowing a host device designed primarily for optical fibre communications to also communicate over unshielded twisted pair networking cable. Commercially available transceivers have a capability up to 2.5 Gbit/s for transmission applications; moreover, aversion of the standard with a bit rate of 10Gbit/s exists, but it can be used only to connect nearby equipment, and is very useful to spare space and power consumption as interface in the client cards of line equipments. Modern optical SFP transceivers support digital optical monitoring functions according to the industry standard SFF-8472 MSA. This feature gives the end user the ability to monitor real-time parametres of the SFP, such as optical output power, optical input power, temperature, laser bias current, and transceiver supply voltage. SFP transceivers are designed to support SONET, Gigabit Ethernet, Fibre Channel, and other communications standards. A 1000 BASE SX SFP shown in Figure 2. One common query we hear is actually one must use a Cisco SFP with Cisco hardware? The answer is “not really” although that is not the answer Cisco wants to give. Perhaps you have used third-party compatible SFPs for your networking, and the price gap is obvious. Brand’s SFPs such as Cisco, Cisco wants their customers buying only Cisco hardware, which is to say the least more expensive than anyone else on the market. They conduct their own optical transceivers, and try very hard to convince buyers that only official Cisco hardware will work. Actually, a few of their hardware such as the Catalyst line will not even access third-party SFPs without running undocumented commands first! That said, it’s simple enough to figure around. Plus, either way, the plain truth is that one optical transceiver from a reputable vendor is just as good as any other. It’s a totally standardized technology, like spark plugs, and one brand’s SFP is going to work fine with any other brand’s hardware. And, like with spark plugs, few people beyond enthusiasts really care about the brand as long as the SFP works once installed. When you are intending to upgrade your network, it makes sense to “cut corners” when those corners really aren’t even being cut at all. Third-party SFP optical transceivers usually cost far less than the “official” units, especially in the case of Cisco, but could supply the exact same performance you’d expect. To get more brand compatible optical SFP transceivers, or other fibre optics equipment and any other questions you might have about your future networking needs, please don’t hesitate to contact FS.COM for everything you need to know! This entry was posted in Fiber Optic Transceivers and tagged 1000Base-SX SFP Transceiver, SFP transceiver, third-party SFP on November 6, 2014 by Admin. A distribution system port connects the controller to a neighbor switch and serves as the data path between these two devices. This chapter discusses a few common methods on the models that have these options. • 1000BASE-SX SFP module which provide a 1000-Mbps wired connection to a network through an 850 nm (SX) fibre-optic link using an LC physical connector. • 1000BASE-LX SFP module which provide a 1000-Mbps wired connection to a network through a 1300nm (LX/LH) fibre-optic link using an LC physical connector. • 1000BASE-T SFP module which provide a 1000-Mbps wired connection to a network through a copper link using an RJ-45 physical connector. The Cisco Catalyst 6500 Series Switch Wireless Integrated Services Module (WiSM) and the Cisco 7600 Series Router WiSM have eight internal Gigabit Ethernet distribution system ports (ports 1 through 8) that connect the switch or router and the integrated controller.These internal ports are located on the backplane of the switch or router and are not visible on the front panel Through these ports the controller can support up to 300 APs. The controller network module within the Cisco 28/37/38xx Series WiSM can support up to 6812 or 25 APs (and up to 256, 256, 350or 350 clients respectively), depending on the version of the network module. The network module supports these APs through a Fast Ethernet distribution system port (on the NM-AIR-WLC6-K9 6-access-point version) or a Gigabit Ethernet distribution system port (on the 8-, 12-, and 25-access-point versions and on the NME-AIR-WLC6-K9 6-access-point version) that connects the router and the integrated controller. This port is located on the router backplane and is not visible on the front panel.The Fast Ethernet port operates at speeds up to 100 Mbps, and the Gigabit Ethernet port operates at speeds up to 1 Gbps. The Catalyst 3750G integrated Wireless LAN Controller(WLC) switch has two internal Gigabit Ethernet distribution system ports (ports 27 and 28) that connect the switch and the integrated controller.These internal ports are located on the switch backplane and are not visible on the front panel Each port is capable of managing up to 48 APs However, Cisco recommends no more than 25 APs per port due to bandwidth constraints. The -S25 and -$50 models allow a total of 25 or 50 APs to join the controller. Each distribution system port is, by default, an 802.1 Q VLAN trunk port. The VLAN trunking characteristics of the port are not configurable. Some controllers support LAG, which bundles all the distribution system ports of the controller into a single 802.3ad port channel. Cisco 4400 series controllers support LAG in software Releases 3.2 and later; Cisco 5500 series controllers Support LAG in software Releases 6.0 and later; and LAG is enabled automatically on the controllers within the Cisco WiSM and the Catalyst 3750G integrated WLC switch. FS offers its own branded 1000BASE SFP module, as the following: 1000BASE-T SFP Transceiver, 1000BASE-SX SFP Transceiver and 1000BASE-LX SFP Transceiver. Now all products from FS are 30% Off. This entry was posted in Fiber Optic Transceivers and tagged 1000Base-SX SFP Transceiver, 1000Base-T SFP Transceiver, SFP transceiver on July 14, 2014 by Admin.